Our library, like many others, is Being Creative this summer. We've had programs on painting, woodworking, sewing, knitting... and now poetry! Starting a new job in the middle of May means that I adopted a poetry workshop in July. I'm glad it worked out this way because it's a program that I probably wouldn't have planned on my own, but it ended up being quite fun! I think I'm even going to incorporate some of the ideas into our after school programming in the fall. I got many ideas from the wonderful book Poetry Aloud Here! : Sharing Poetry with Children in the Library by Sylvia M. Vardell. 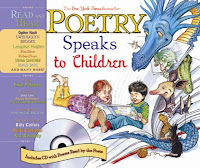 Although it speaks more to school media folk than public librarians doing a one-time program, the book has a lot of great lists of poems and poetry volumes to share with kids. I also pulled ideas from the National Endowment for the Humanities's EDSITEment website All Together Now: Collaborations in Poetry Writing. "Stopping by Woods on a Snowy Evening" by Robert Frost (from the book Poetry Speaks to Children) - I asked the kids to close their eyes and try to "see" the wintry images in the poems. And I ended with a few Shel Silverstein poems. Pick out your favorites (there are many to choose from). I read "Sick", "Recipe for a Hippopotamus Sandwich", "Sarah Cynthia Silvia Stout Would Not Take the Garbage Out", and "I Must Remember" from Where the Sidewalk Ends. I did two sessions of this program and I didn't read all of these in both sessions. I shared poems for about 15 minutes. Whatif the trees don't grow? Whatif there's no baseball to throw? Whatif there's no row of chairs? Whatif there are lice on our hairs? Whatif there's no peanut butter? Whatif there was no gutter? Whatif I don't have a pair of shoes? Whatif my best friend moves? Whatif there is no ooze? We could have gone on all day coming up with more lines and if you have easy access to a copier, you could copy the poem down and give a copy to the kids. Have them illustrate it or simply have them take it home and call it a day. I had one more activity planned. I cut out (well, to be honest my colleague T cut out) hundreds of typed words and had the kids glue them on blank paper as a kind of "magnetic poetry" craft. The kids who were able to read picked out specific words for their poems. The kids who couldn't read either drew pictures or just picked out random words (those were some of the best - very silly!). It was fairly labor-intensive to cut out all those words and as any "magnetic poet" can tell you, it's sometimes frustrating to sift through all the words looking for the word you want. If I did the magnetic poetry craft again, I'd make the words a larger size. Truthfully, I think the program didn't really need that last craft and just the activity of creating poems together would have been fun for the kids, especially if they could take a copy of the poems home with them. Both sessions went well and I think it was a fun introductory poetry program. I think the kids were relieved that there was no pressure to write and/or share a poem (although, of course, if kids wanted to share their poems they were welcome to!). In the first session several of them asked if they could read one of Silverstein's poems out loud to the group and while everyone was working on their craft, they passed the book around and around, reading poems. What a wonderful way to spend an afternoon! It's Poetry Friday and Mary Lee has the round up over at A Year of Reading.